Since 1955, the National Association for the Specialty Food Trade (NASFT) has held the Fancy Food Show. 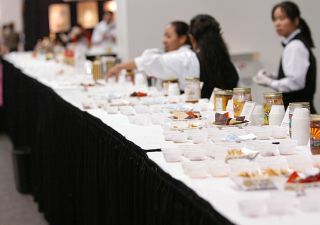 Here are some highlights from the Winter 2006 Fancy Food Show held in San Francisco's Moscone Center. There were more than 40,000 products being exhibited at this winter's Fancy Food Show. Unfortunately, I only had one day to see (and taste) as many of these products as I could. I put together a list of what I thought were the best of what I was able to experience. 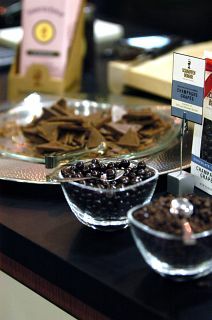 Other chocolates of note include Sweet Riot's chocolate covered nibs. 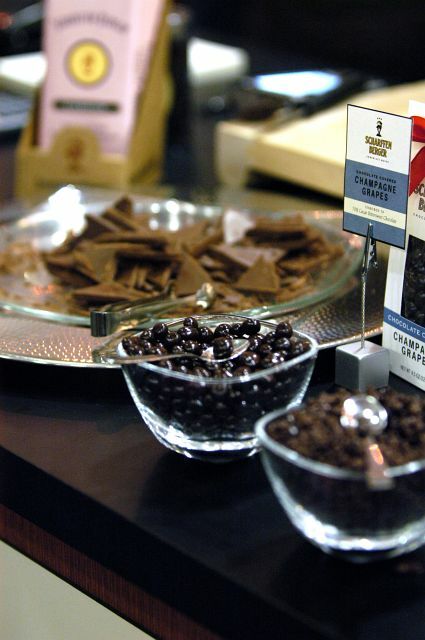 They take roasted cacao nibs, crush them, and encase the nibs in different types of chocolate. I have a thing for trying new beverages. If we're traveling in a new area and I see a soft drink or juice flavor that I haven't tried before, I have to get it and try it. 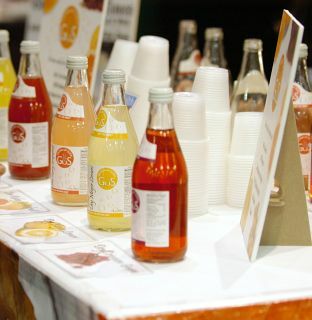 One of the better beverages we tasted was GuS (Grown-Up Soda). One of Tina's complaints about sodas is that they are too sweet. GuS is a carbonated beverage with just the right amount of cane sugar (not HFCS) and fruit concentrates. We also tried IZZE sparkling juice but found them to be not sweet enough (most of the sparkling juices tasted a bit too sour to us. Another great beverage was the Cabernet Grape Juice from Didier Goubet. As far as I know, this beverage is only available in France (unless a distributor picks it up and starts distribution in the U.S.) and is made from the juice of Cabernet grapes from the Bordeaux region of France. The juice, like all grape juices, was very sweet, but, unlike the garden variety grape juice, it had a more complicated flavor and a stronger fruitiness. 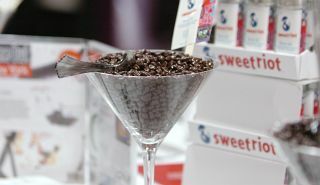 Jan. 2007 Update:Sweetwater Cellars has picked up the Didier Goubet Cabernet Grape Juice for distribution. They also have the Didier Goubet Merlot and a variety of other specialty grape juices. Another great beverage not currently available in the United States, is Elderflower Pressé from Belvoir Fruit Farms. This beverage is lightly carbonated and has a pleasant floral and lemony flavor. 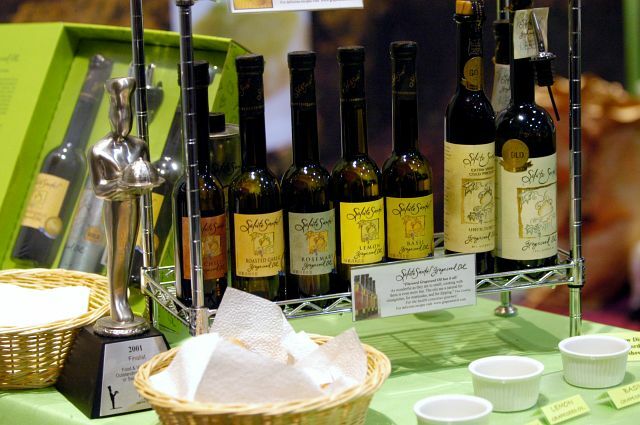 Jan. 2007 Update:Chefs' Warehouse now sells Elderberry Presse by the case. I can't tell from the website if the producer is Belvoir Fruit Farms. 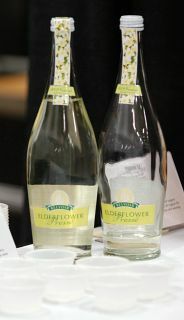 The worst beverage I tasted at the Fancy Food Show is the Carl Jung De-Alcoholized Sparkling Wine, a product that has been produced in Germany since 1903. To me, it tasted simply of acid and yeast. 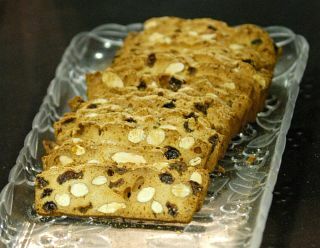 Almondina is a super-thinly sliced biscotti that's made mostly of almonds and dried fruit instead of flour. The cookie is crispy and perfectly textured for eating out of hand and dipping. The most intriguing food we saw at the show was called Cavi-Art. 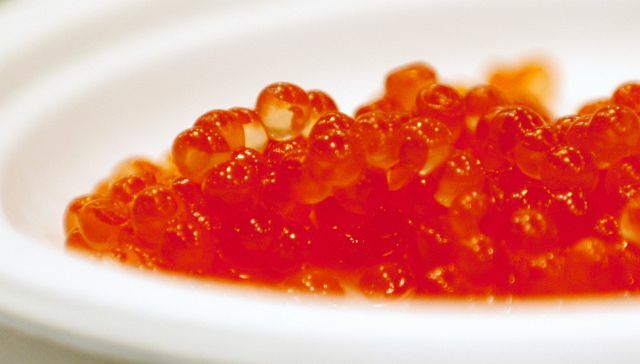 Cavi-Art is a product made of seaweed that looks and tastes exactly like salmon caviar or lumpfish caviar (four varieties). When we were first presented with the salmon Cavi-Art, we thought it looked amazing. Even after being told it was made from seaweed and after close examination, I thought it looked exactly like salmon roe. (Unfortunately, I didn't have a side by side comparison with real salmon roe.) The flavor and texture of the roe was uncanny as well. The surface of each Cavi-Art drop had just the right amount of tension and the burst of flavor as they burst in your mouth was so close to salmon roe that I honestly couldn't tell the difference. I think the main benefits of Cavi-Art is that it's shelf stable, doesn't contribute to overfishing, and (for calorie conscious guests) low in calories. 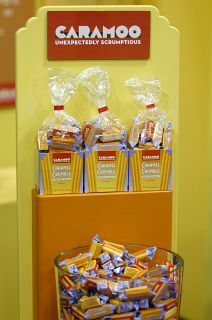 The last food item I'll mention is a product called Caramoo Caramel Crumble. Chances are everyone reading this will have tasted something like Caramel Crumble before, but might have forgotten over time. 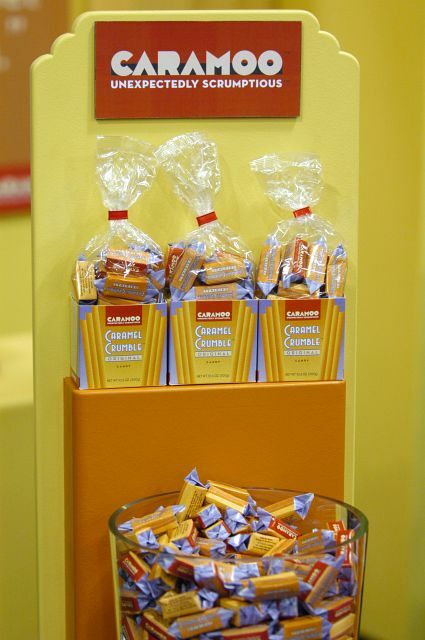 Caramel Crumble is, just as the name suggests, simply a crumbly textured caramel candy. 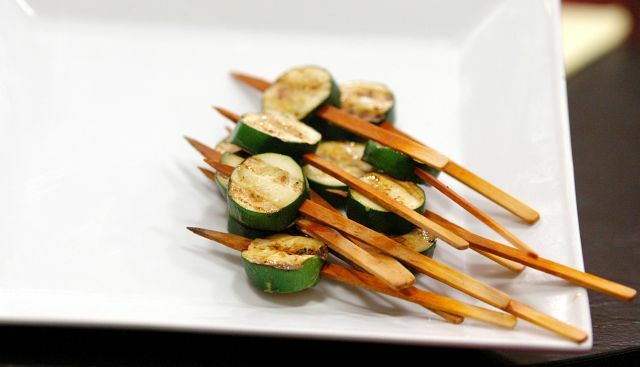 The texture is kind of like an aged cheese that falls apart as you chew it. The flavor is plain caramel. I remember having something like it as a kid, but I have no idea who made it or where I got it. It's a caramel candy that's fun to eat and doesn't stick to your teeth. The only problem is that it doesn't last too long (because you can chew it) and due to the short duration in your mouth, you'll probably end up eating too many. Every time you post a new entry, your RSS sends a host of back entries to LiveJournal - this time, 13 of your posts show up on my friends page. Is this a problem with your feed or LJ? As much as I love this blog, I don't really want all your past entries to show up when there's a new one. What's up? Unfortunately, I don't know what the problem is. My feed validates as an Atom 1.0 feed without any errors and warnings, but I am aware that several readers have problems with the feed. It's a slow process trying to figure it out, but I'll keep working on it when I get free time. In the future, please e-mail cooking@cookingforengineers.com with these inquires. 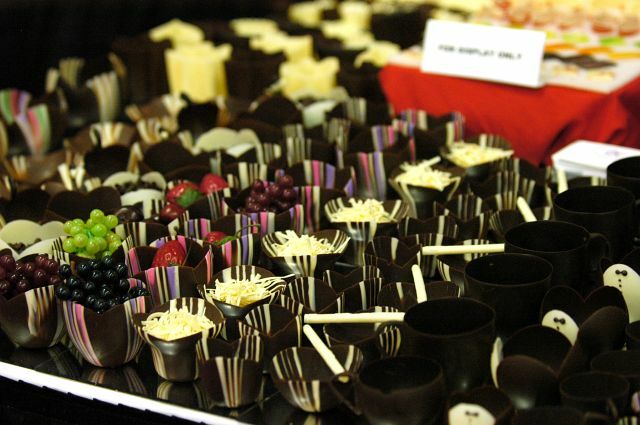 Oddly enough, one of the agreed best chocolate sources in the world is in Hawaii... Unfortunately, due to the small size of the plantation it's only sold to restaurants. 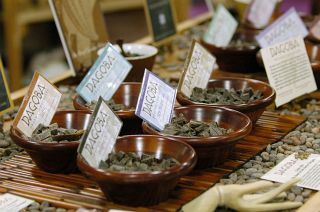 Any idea which bean variety Dagobas was using? Just curious, what's causing a failure to purchase the VW that you mentioned earlier? The ones I'm able to find are all at least $5K more than the comparable gasoline version.